Hard turning is a manufacturing process widely used in aerospace industries. The effect of hard turning on the surface integrity is mainly influenced by the choice of the process parameters. The aim of this paper is to present an exhaustive study for optimizing the hard turning process parameters using the response surface methodology (RSM) coupled with the finite element method. In particular, a case study is developed where AISI 52100 (62 HRc) is machined by PCBN tool. For this purpose, a finite element model (FEM) of orthogonal cutting is developed by the software ABAQUS. 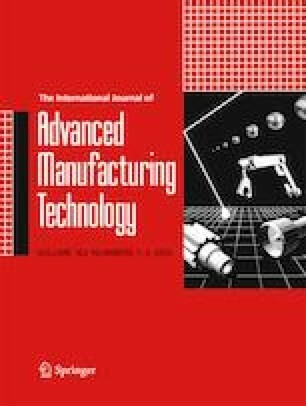 In this study, empirical models of machining forces and white layers (WL) thickness are developed. The empirical models have been determined using the RSM, in which three factors with three levels are implemented. The cutting speed, the feed rate, and the depth of cut are considered as the main input parameters. The analysis of variance (ANOVA) was also employed in order to analyze the effects and interactions of the cutting parameters on the performance of machined parts. Lastly, the optimum parametric combination is determined to allow the minimization of machining forces and WL thickness. The proposed approach can be considered as a helpful method for engineering design to optimize hard turning parameters.